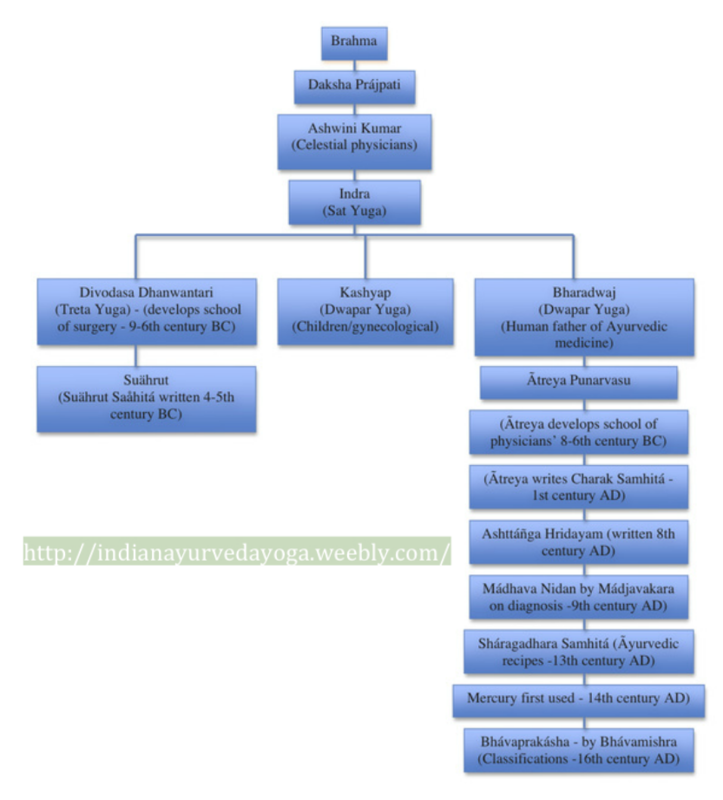 The true history of Ayurveda starts from the time of the Holy books, the Vedas. Ancient mythology contends that the concept and essence of Ayurveda was revealed by the creator of the world himself – Lord Brahma. The Vedas date back to about five thousand years. They preach the philosophy of life. The Atharvaveda contains the principles of healing on which Ayurveda is based. 'Ayur' means 'life' in Sanskrit. Ayurveda is the most ancient science of healing which enhances longevity. It has influenced many of the older traditional methods of healing including Tibetan, Chinese and Greek medicine. Hence, Ayurveda is considered by many as the 'mother of healing.' The hymns, the mantras and the medical information contained in the Vedas were contributions of Rishis and munis or sages, over a period of time. Many of these sages were learned saints who devoted their life to understanding the world. Aryavarta, the native land of Aryans, covers a large area surrounding the Himalayas and is believed to be the place where the Rishis and Munis lived. At present it covers areas in countries like Nepal, India, Pakistan, Bhutan and Tibet. The civilizations of these countries are deeply influenced by the unique intellectual contributions of these Rishis and Munis.